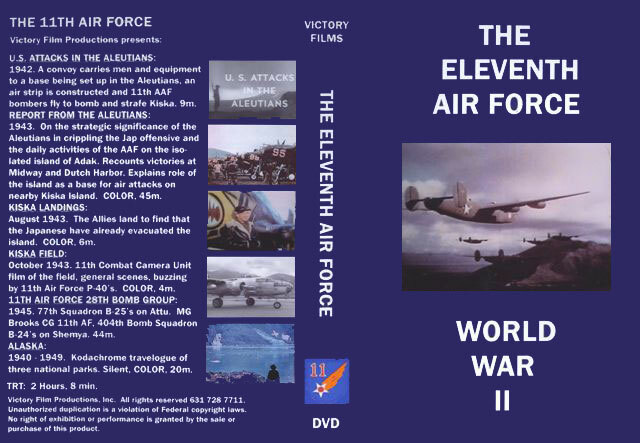 “The Eleventh Air Force World War II"
The 11th Air Force stationed in Alaska during the critical period after Pearl Harbor not only had to fight the Japanese but also the environment, especially the weather. Flying in remote areas with limited weather reporting facilities it was not uncommon for them to lose more aircraft from weather and training than to the Japanese. This does not mean that the Japanese were a push over, but like the 11th AF they were at the end of a long and precarious supply line. The DVD starts off with six chapters that allow you to navigate to the start of each section. The first section is a newsreel entitled “US Attacks in the Aluetians”. It is a typical WWII newsreel. Filmed in B&W you are immediately taken back by the barren terrain. The tents are built into the hillside with no protection from the elements let alone the Japanese. The permafrost preventing soldiers from digging trenches or protective cover. That doesn’t stop the Seabees from building an airfield and it is immediately occuopied by B-24Ds, P-39s, P-38 and B-17s. Despite the best efforts of the engineers there is mud everywhere. When you see the aircraft up close I’m under the impression that you can’t overweather a model airplane. These things are covered in mud. The next segment is in color, “Report from the Aluetians”, shows the picturesque and beautiful landscape and then you come back to the airfield. There is nothing picturesque about it. In the words from the “Battle of Britian”, “Muck and filth everywhere Mr. Warwick.” It is a testament to the ground crews for working in such conditions. There are some interesting differences in the aircraft. There are unique RDF, or ADF, setups on the fuselage and wings. The aircraft again have so much mud on them that it is amazing that they can fly. Landing and taking off is certainly the most precarious of operations. Navy fans will find cruisers and destroyers on sub patrol. What the newsreel does show is boredom. You can see how the 1.5 million square feet of PSP is laid down. The aircraft are so dirty and filthy that it is impossible to over weather a model. A crashed P-38 is particularly interesting in the sequence. There are B-26s in the background as a funeral is held in the sobering barren terrain. Bomb loading and the colors of the bombs are interesting. I’m not sure if they were painted special for the documentary or not but they sure all colorful. The P-38E/F are seen to good effect. There are no aces here as there just isn’t enough Japanese airplanes around. Jack Chenault and his P-40E are seen and he is credited with one Zero and one Submarine. I noticed that the white ID band is really poorly painted. The bombers are significantly lower than Europe, not quite as low as Ploesti, but low for high altitude bombers. The formations are tight and low. It is intersting to see B-17s at low altitude straffing. That is as unique as this theater of operation. The third segment is a newsreel, “Kiska Landings-Aug 43”. Shot in beautiful color this landing is not the thing that D-Day would be. There were 313 KIAs on an undefended and unoccupied island. Friendly fire, booby traps and accidents taking there toll on the troops. Truly tragic. The 11th Air Force Fighters, mostly P-40s, are seen in low buzz jobs. Descent but certainly not a John Godfrey beat up. Bombers of the 77th Bomb Squadron are the highlight of the next newsreel. What I didn’t know was that drop tank modified B-25s were able to bomb the north islands of Japan. You see the detailed briefing. The raids are small with four missions of four bombers each but they were bombing Japan. The weather is bleak and overcast. The Natural Metal Finished B-25s are interesting. The props are even in NMF, actually everything is with just the stars and bars being the only color seen. General Brooks visit is the next installment. Featured in this sequence are some B-24s with unique turret systems. You see them in close formation on one of the final missions of the war, 12 August 1945. Another highlight is a highly polished C-47 with 11th Air Force markings with no other colors except the stars and bars. A very classic looking airplane. The final segment is on the 404th Squadron, 28th Bomb Group flying a 15 hour and 5 minute mission on the 11th Air Forces last mission on 13 Aug. You can tell that even with the end of the war insight that these men feel they have been frozen and forgotten. Morale is low to say the least. As an interesting side note, more aircraft were lost to weather than to the Japanese. This speaks volumes to the courage and sacrifice to the airmen and soldiers who protected our northern border. I can highly recommend this title, as well as, all the other titles available from Victory Films. They really provide some of the clearest renditions of the available footage, plus some never before seen footage. If you are a historian or modeler then these are an invaluable asset to your research. A moving and gripping account of the war in color and black and white. Thanks to Wade Meyers Studios for the review copy. You can obtain your copy of this and all the other great titles from Victory Films at http://wademeyersart.tripod.com/id73.html . Let him know you heard about it here.